Know for its scenic mountain vistas and sheep farms with an economy based on fishing, tourism and whiskey-distilling, Scotland's Isle of Skye is now the first real-world location officially twinned with a video game setting. One of the prettiest places on the planet, now a Skylanders: Swap Force marketing tool. I suppose pairing The Skylands' floating islands with the Isle of Skye's fog-shrouded mountain tops is a good fit. In the right light, under certain conditions, those craggy rocks can look like islands floating in the clouds. They're the sort of thing that inspires 70s rock album covers, fantasy novels, and crack marketing teams. VisitScotland's Alan Mackenzie thinks this is a great idea, and says so via official announcement. 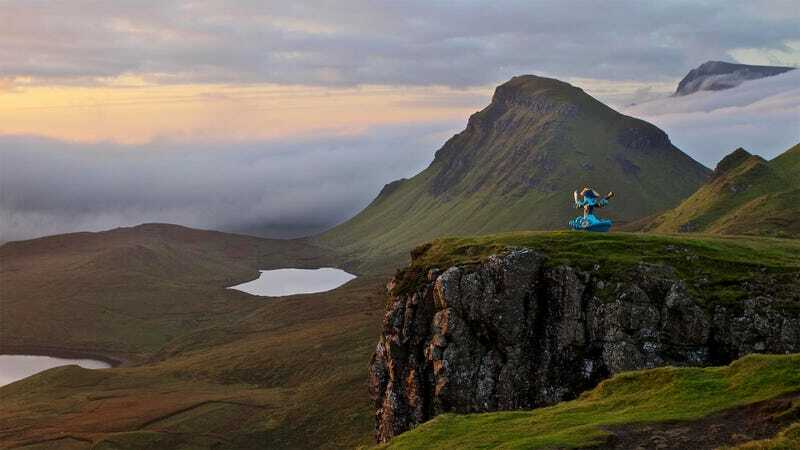 "The Isle of Skye is renowned for its stunning landscapes, which possess an almost ethereal quality, and its abundance of wildlife, making it the perfect place to virtually twin with Skylands, home to Skylanders SWAP Force. We're thrilled to be teaming up with the Skylanders franchise for this unique partnership, which will help raise the profile of this beautiful part of the world, encouraging families to enjoy a real-life adventure on the Isle of Skye - nowhere else on Earth comes close!" While no official deed of twinning has been signed, since one of the places does not exist, Activision will be sending characters around to various child-friendly Isle of Skye landmarks, and they've made the island's official webpage turn into an ad when you type in 'SWAP' while visiting it. I guess when you're one of Activision's most popular and profitable franchises, a simple billboard just won't do.